Picture this: It's a hot summer day. Cows in a field are seeking shade under solar panels. And those panels? They're feeding two electric vehicle chargers -- and powering an office building nearby. That will be the scene in a few months at the University of Minnesota's West Central Research and Outreach Center in Morris. Today, the university community is celebrating the arrival of the only fast electric vehicle charger for more than 100 miles around. And later this spring, a 30-kilowatt solar array will be installed in an adjacent cow pasture, sending clean power to the charger. It's a big deal for electric vehicle ownership in western Minnesota: It can take days to charge an electric car at home from a regular electric outlet. Before now, the nearest fast charger was 120 miles away in Monticello. "It's sort of a wasteland beyond Monticello, and there's nothing west of us," said Eric Buchanan, a renewable energy researcher at the center. 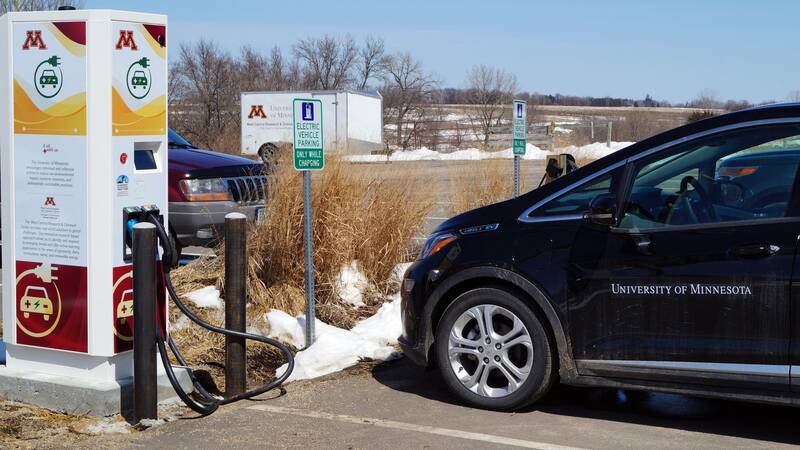 Tesla drivers, Buchanan acknowledges, have access to a network of fast chargers built by the company, but drivers of other electric vehicles in western Minnesota have otherwise been stuck with slower chargers. For that reason, you don't see many electric vehicles in rural Minnesota — yet. The new fast charger in Morris can substantially charge an electric vehicle's battery in an hour, Buchanan said. The center also has a Level 2 charger, which takes five to six hours. They'll both be available to the public for free, at least initially. The West Central Research and Outreach Center received state funding — from the Minnesota Environmental Natural Resources Trust Fund, which comes from lottery proceeds — to build the station. For now, it will charge up the center's new Chevy Bolt, which has a 230-mile range in the summer. That will allow researchers to drive to dairy farms or meetings in the Twin Cities, said Brad Heins, an associate professor of organic dairy production at the center. Heins sees solar energy as one way to offset electricity use at dairy farms while also providing additional benefits. "It shades the cows in the pasture, so it will help cow behavior and health as well as provide electricity," he said. Agriculture is Minnesota's third-largest source of greenhouse gas emissions behind electricity production and transportation. Cow digestion, fertilizer use, soil tillage and powering farm equipment are among the activities contributing to that footprint. "Our overarching mission here," Buchanan said, "is greening agriculture." Heins and Buchanan have also been using heat pumps and energy efficiency tools to bring down electricity use at the research dairy in Morris. The next step is to monitor energy use at other dairy farms and figure out what to tackle next.